Since 1970 the Law in Context series has been at the forefront of the movement to broaden the study of law. It has been a vehicle for the publication of innovative scholarly books that treat law and legal phenomena critically in their social, political and economic contexts from a variety of perspectives. The series particularly aims to publish scholarly legal writing that brings fresh perspectives to bear on new and existing areas of law taught in universities. A contextual approach involves treating legal subjects broadly, using materials from other social sciences, and from any other discipline that helps to explain the operation in practice of the subject under discussion. It is hoped that this orientation is at once more stimulating and more realistic than the bare exposition of legal rules. 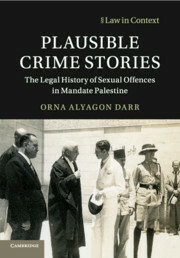 The series includes original books that have a different emphasis from traditional legal textbooks, while maintaining the same high standards of scholarship. They are written primarily for undergraduate and graduate students of law and of other disciplines, but will also appeal to a wider readership. In the past, most books in the series have focused on English law, but recent publications include books on European law, globalisation, transnational legal processes, and comparative law.